The company is re-organized in 1997, has become a professional manufacturer in Personal Protective Equipment fields and specializes in the manufacture of disposable dust masks more than 38 years. We are the first supplier in Taiwan to develop molded disposable masks, grant CE approval and sell to worldwide market. Our head office locates in Taipei, Taiwan, mainly dedicated to supporting of sales, after service and logistics activities. Our factories located in Guang Dong, JiangXi Province, China and Binh Duong Province, Vietnam, with areas of 33,330 square meters, 46,660 square meters and 39,999 square meters respectively. We have approximately total 900 employees and provide capacity of 100 million disposable masks annually. Developed first molded disposable mask in Taiwan and sold to worldwide. Granted EN149 CE certificate from Germany BIA for P1 masks in February. Granted AS/NZS 1716 License (LIC NO. 1508) from Australia QAS in August. New China factory was founded in Guang Dong on 29 September. New China factory was inaugurated on 23 November and started production. Granted EN149:2001 certificate from BSI in U.K. for FFP1, FFP2 & FFP3 masks. Granted Quality System Certificate from China Quality Certification Centre for Import and Export. Granted NIOSH 42CFR84 approval for N95, R95 & P100 masks from U.S. NIOSH / CDC. The first manufacturer in Asia to grant NIOSH approval for P100 masks. Granted AS/NZS 1716 License (LIC NO.1508) from Australia SAI Global for P1 & P2 masks. A new 4-floors building for masks production was founded in August. 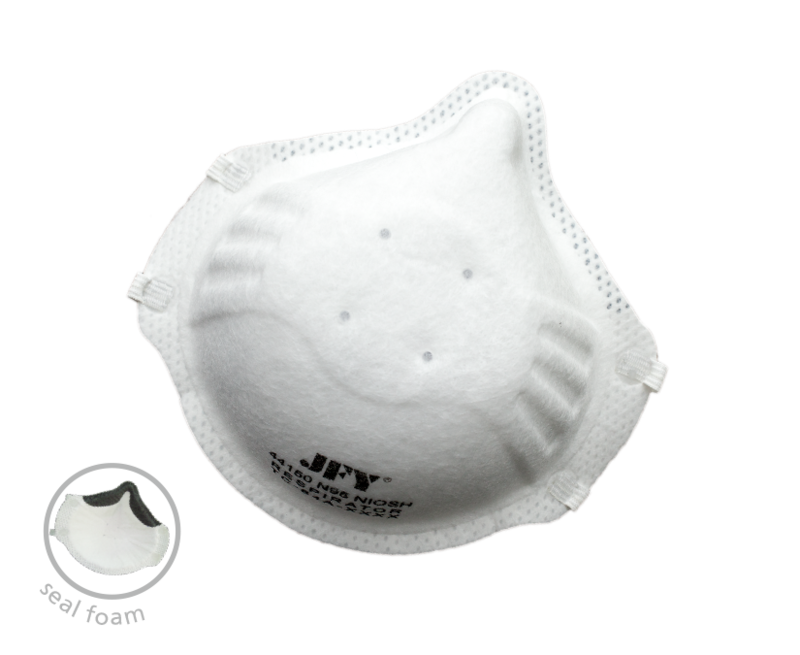 JFY masks with additional of the clogging option is available from August. New building for masks production was finished & started to use with air conditioner and clean environment. The second plant was founded near Ho Chi Min City, Vietnam on 4 February. Vietnam factory was inaugurated on 25 October and started production. Vietnam factory granted ISO 9001:2000 certificate by AJA in February. 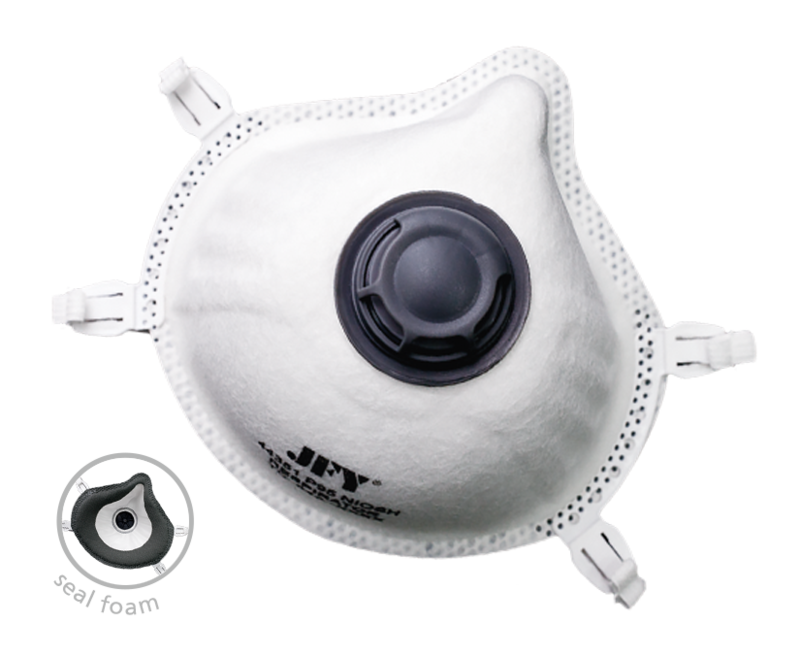 JFY masks conforms to the EN143:2000 A1 - 120mg loading test are available from May. The third plant was founded in Jiangxi Province in December. Granted AS/NZS 1716:2003 License (BMP 547903) from Benchmark, Australia for P1 & P2 masks. Updated to EN149:2001+A1:2009 Classification – Single shift NR by BSI in March. Has been updated to ISO Certificate ISO 9001:2008. The third plant had started production in Jiangxi Province. Jiangxi factory granted ISO 9001:2008 certificate by BSI in December. 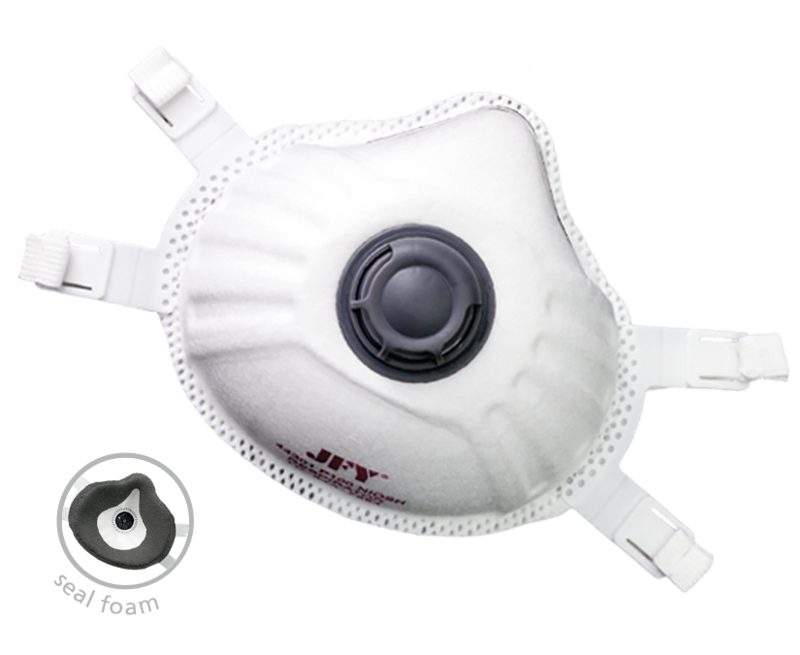 The first manufacturer in Asia to grant NIOSH approval for N100 masks. New series 22xxx moulded masks granted EN149:2001+A1:2009 and AS/NZS 1716:2012. New series 4xxx vertical fold flat masks granted EN149:2001+A1:2009. New series 44150, 44151, and 44153 granted NIOSH approval for N95 masks. New model 44301 has granted NIOSH approval for P100 masks. Updated EU Type Examination Certificate to the new PPE Regulation (EU) 2016/425 in August and the Certificate Number is CE 690046. Conformity to Type based on Internal Production Control plus supervised product checks at random intervals from BSI, the Certificate Number is CE 60966. New model 44351 has granted NIOSH approval for P95 masks.